This chart shows the radiant point for the Geminid meteor shower. This week marks the peak of what is usually considered the most satisfying of all annual meteor displays: the Geminid meteor shower. As was the case with last month’s Leonid meteor shower, however, prospective skywatchers should be aware that once again, observers will face a major obstacle in their attempt to see this year’s Geminid performance, namely, the moon. The Geminids are already around, having been active only in a very weak and scattered form since about Dec. 7. Geminid activity is expected to be on an upswing in the nights to come, leading up to their peak on Friday night (Dec. 13). Historically, this shower has a reputation for being rich both in slow, bright, meteors as well as rather faint meteors, with relatively few of medium brightness. Many Geminid meteor shower streaks appear yellowish in hue. Every once in a while, a Geminid fireball will blaze forth, bright enough to be quite spectacular and more than capable of attracting attention even in bright moonlight. "If you have not yet seen a mighty Geminid fireball arcing gracefully across an expanse of sky, then you have not seen a meteor," astronomers David Levy and Stephen Edberg wrote in their book, "Observe Meteors," published by the Astronomical League. 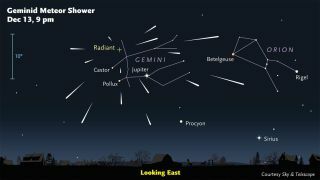 The best times to look for streaking Geminids this year will be during the predawn hours several mornings before the night of full moon when the constellation Gemini will be standing high in the northwest sky. In fact, three “windows” of dark skies will be available between moonset and the first light of dawn on the mornings of Dec. 13, 14 and 15. Generally speaking, there will be about two hours of completely dark skies available on the morning of Dec. 13. This window shrinks to only about an hour on the 14th, and to less than 10 minutes by the morning of the 15th. The Geminids have a tendency to rise slowly toward their maximum. The day before they peak, the majority of the meteors that are seen are usually rather faint. But at the peak as well as the day after, the shower is dominated by a preponderance of bright meteors. And the intensity of the display drops off rather sharply the day after the peak. So during the two-hour period of dark skies on the morning of Friday, the 13th, if you’re at a location free from light pollution and with a wide-open view of the sky, you should expect to see an average of 30 to 60 Geminids per hour, though many will probably be rather faint. The shower peaks on Saturday morning but there is only about one hour of darkness before moonset and the first light of dawn. Nonetheless, during that hour, you might be treated to the best meteor performance of the year with possibly 60 to 120 Geminid sightings, many of them bright and perhaps a few outstandingly bright fireballs thrown in for good measure. By Sunday morning, the peak of the shower will have passed and the activity will be rapidly declining; average rates of 15 to 30 bright meteors per hour are possible, but unfortunately observers will have a very limited amount of time — mere minutes — of darkness between the setting of a practically full moon and the dawn’s early light. All times in this chart are a.m. and are local standard times. “MS” is the time of moonset. “Dawn” is the time when morning (astronomical) twilight begins. “Win” is the available window of dark sky composed of the number of minutes between the time of moonset and the start of twilight. Warm cocoa, tea or coffee can take the edge off the chill, as well as provide a slight stimulus. It's even better if you can observe with friends. That way, you can keep each other awake, as well as cover more sky. Give your eyes time to dark-adapt before starting. Probably the best bet is to rest on a lawn lounge, all the way back, so you can look up and see the whole sky. When you see a streak, mentally run it backwards across the sky. Do the same with the second and third and note where their paths cross. Right there will be the bright star Castor in Gemini (with the brilliant planet Jupiter also shining not too far to the south), and that’s the region of the sky where the Geminids will appear to fan out from. A final point to note are that Geminids stand apart from the other meteor showers in that they seem to have been spawned not by a comet, but by 3200 Phaeton, an Earth-crossing asteroid. Then again, the Geminids may be comet debris after all, for some astronomers consider Phaeton to really be the dead nucleus of a burned-out comet that somehow got trapped into an unusually tight orbit. Editor's note: If you have an amazing night sky photo of the Geminids or any other view you'd like to share for a possible story or image gallery, please contact managing editor Tariq Malik at spacephotos@space.com. Joe Rao serves as an instructor and guest lecturer at New York's Hayden Planetarium. He writes about astronomy for Natural History magazine, the Farmer's Almanac and other publications, and he is also an on-camera meteorologist for News 12 Westchester, N.Y. Follow us @Spacedotcom, Facebookand Google+. Original article on SPACE.com.